I’m happy when I find my weaving rhythm, and I’m almost there with this scarf. This alpaca yarn is a weaver’s dream. No warp ends are breaking, and the weft compliantly scoots into place. That means I can put most of my attention on other details. Getting the kinks out at the start of the warp. 1-2-3-4-5-6-7-8; 1-3-5-7; 2-4-6-8. I always plan enough warp to be able to practice first. I have plenty of “oops” in the first few inches. This wavy 8-shaft twill has straight twill threading, which means the pattern is in the treadling. 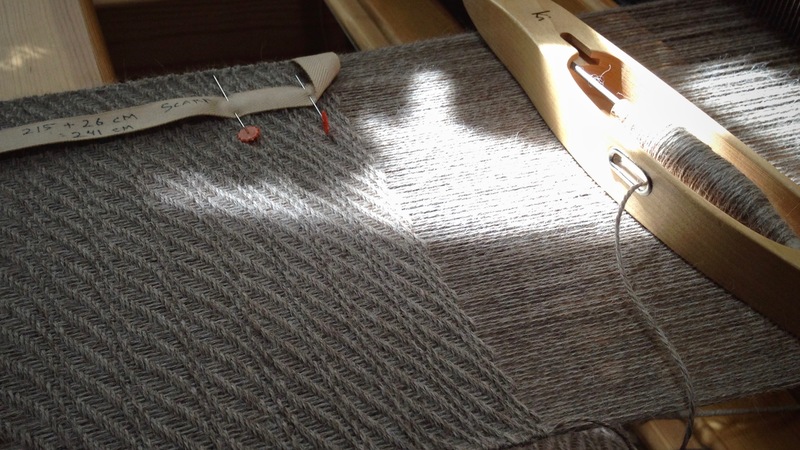 It’s not difficult treadling…once you get the hang of it. But, as usual, it takes practice. It is tricky to find and correct errors because of the subtle curve in the pattern. 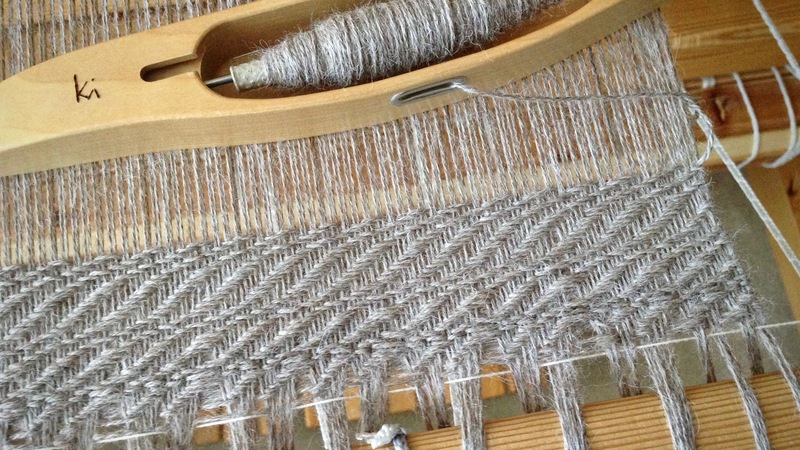 The more practice I get, the smoother the weaving goes, and the fewer errors I make. There is no shortcut to the kind of confidence that comes from attentive practice. Weaving in the afternoon sun. Whimsically weaving a bit of sunlight into the cloth. When weaving rhythm takes off, quality improves, as does weaving enjoyment. May you unwrap your gifts. Oooo! Undulating twill. When I was a relatively new weaver, I was delighted to learn I could weave something so complex looking on my four harness loom. Yours is gorgeous and the alpaca yarn must feel so soft and delicious. I love the gentle color of your yarn. Hi Julia, Yes, this alpaca yarn is amazingly soft; and the natural alpaca color is so soothing to work with. And the undulating twill never gets old. It’s a very satisfying project. Karen, I enjoy so much reading your posts. It helps me in my weaving skills and gives me neat ideas to try. It also is encouraging to me in my walk with God. I recently got an older Glimakra standard loom I’m having fun getting acquainted with. What is the easiest way to move the beater back (and then forward again) on the notches? Do you use both hands, and put one under he beater and one on the upper cross bar to hoist it back? Mine weaves 52″ so is a rather heavy beater. I don’t want to have to get up to do it, because that is why I’m moving it – to avoid having to get up as often to release the ratchet. Just wondering how to do it with the least amount of body strain. Hi Lynette, It makes me so happy that you find value in what you read here. 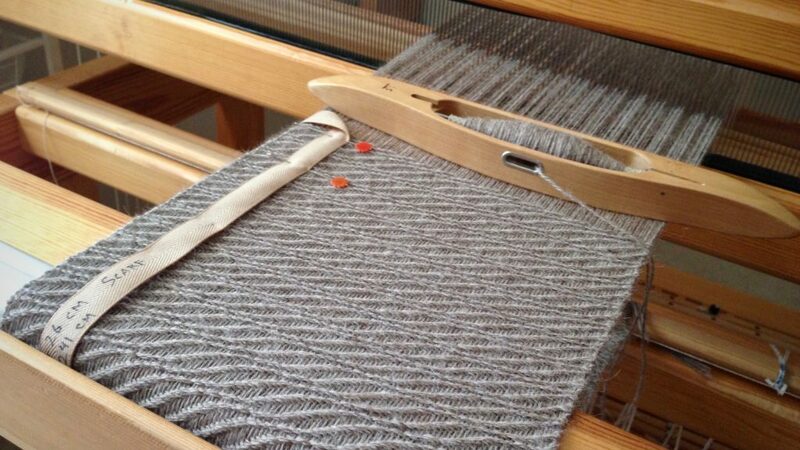 On my smaller Ideal loom, I can “pick up” the beater at the upper crossbar with both hands and move it back or forward a notch. Not so on the Standard. Mine is 47″, and it’s heavy for me, so I move one side at a time. I put one hand under the beater, with my elbow on the breast beam for support. The other hand is on the upper cross bar. I mostly use the front two notches. To move it to the third notch is a bit of a strain for me, so I usually avoid that. Thanks, Karen, that makes sense. It’s good exercise! Hi Karen, Looking forward to seeing the Alpaca scarf when finished…too bad we won’t be able to feel it…soft and cuddly, I’m sure, not to mention beautiful. I’m really curious about the breast beam on the loom, can you tell us about it. Hi Laura, I sure wish you could come over here and feel this soft and cuddly alpaca! The breast beam has an aluminum guard on it. What you see at the front of the breast beam is the fabric protector, aka “belly board.” It is a thin piece of wood that slips in at sides of the front of the breast beam, and protects the fabric from abrasion as it rounds the breast beam. As the weaver, I can lean right onto the breast beam without rubbing the fabric. Hi Nanette, Thanks for asking. I use twill tape, but grosgrain ribbon works, too. I mark the beginning and end measurement of the project onto the tape with a fine tip Sharpie. If there are hems, I include markings for that, too. I like to write the total # of inches or cm on the tape so I can reuse it without measuring it. I mark a line on the tape at the midway point, and if it’s a long project, I mark the 1/4 and 3/4 points on the tape. When you have an inch or two woven, line up the starting line and pin the tape to the woven fabric using two straight pins. Leapfrog the pins as you advance the warp. Nanette, It’s my joy to answer whatever questions I can. I love questions! New reader of your blog here, thanks for your interesting projects! Are you willing to share your draft for this turned undulating twill? I fiddled around on the weaving software and couldn’t quite get mine to look like yours. Thanks! Hi Margaret, Welcome! It’s great to have you. Many of my drafts start from ideas in Swedish weaving books, and I write the draft out with pencil and graph paper. This one came from “The Big Book of Weaving,” by Laila Lundell. I don’t have the book in front of me right now, so I’m sorry I can’t tell you the page number. The project in the book has “Wavy Twill” in the title. Yes! I’m always telling people that everyone has a gift. You just have to find it. Then when you do, you should respect it by putting in the hours to develop it into something great. Missie, Good point. It does take hours and hours to develop a gift. Sometimes we think if we are gifted at something we shouldn’t have to work at it. But success comes when effort and time are invested in the gift.